The last time we’d done the evening out downtown was during the G20 in 2010, when the streets of downtown Toronto were virtually empty and heavily armed police officers were deployed everywhere. It was so quiet, it was eerie. Back then, the headliner in the concert in the Nathan Phillips Square tent was Herbie Hancock. The opening musician for Herbie was a young Australian woman who played a bass that dwarfed her. But man, did she control that instrument. Herbie, on the other hand, seemed to be holding back. Didn’t play his best-known tunes but some new stuff few recognized. Perhaps he was tired. Last night, Hub and I enjoyed another yummy dinner at Spadina Garden Restaurant on Dundas Street at Bay in Toronto, along with my handsome brother and his gorgeous wife. There’s the omnipresent construction at City Hall and the panhandlers who hang out on the periphery of the diverse but upscale crowd. Why not – there was money to be had. With the Ticketmaster ‘convenience fees’, we paid almost $200 for two ducats. Makes you go hmmmm. Why is Ticketmaster involved in ticket sales? It’s scandalous and a total ripoff! Amazon doesn’t charge ‘convenience fees’ for buying books! And there’s no alternatives – we must use TM. They’re worse than scalpers. The seats in the big tent filled up fast. Half as many people brought folding chairs and set up in the Square to hear for FREE what we paid big bucks for. We were privileged to hear Treasa Levasseur open for the legendary George Benson. 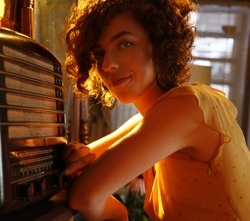 Treasa, a Toronto bluesy-jazz singer, is a beautiful multi-talented performer on so many levels – her joyous smile, powerful voice, deft piano playing and bouncing energy had us all laughing at her song-stories and clapping along. An hour with Treasa and her band members was time well spent. 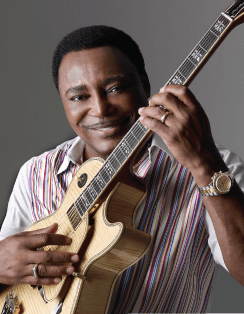 George Benson. All I can say is this: FULL VALUE. I’ve been listening to his music for as long as I can remember and it was a thrill to see/hear him in concert. George is 70 and has been married to the same woman for over 40 years. That kind of stability imbues his smooth-jazz guitar and vocals. He played many of our favourites and some new tunes, backed by a stellar band – a pair of pianists, an energetic bass player, a skilled young drummer and the backup vocals and guitar accompanist. That tent was rockin’ by the end of the evening. Mr. Benson did not waver in his energy and focus on delivering what we’d come to hear. It was a total WOW – when the concert ended at 11 p.m., we were all spent, but so bloody happy to have been there. He mentioned that he’ll be back with the Toronto Symphony presenting a Nat King Cole review. Can’t wait. Here’s a 2007 video. He’s a little thicker and his voice is raspier now, but still enthralling.